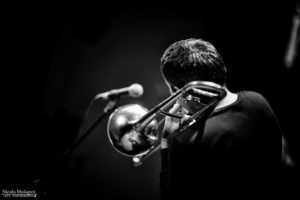 Uno dei più talentuosi trombonisti al mondo (ha vinto per due anni consecutivi il il celebre “Critics Poll” della rivista Down Beat, nella categoria “artisti emergenti”), Gianluca Petrella (classe 1975) ha iniziato la sua carriera oltre 20 anni fa. Ha collaborato con artisti internazionali – quali Steve Swallow, Greg Osby, Carla Bley, Steve Coleman, Tom Varner, Michel Godard, Lester Bowie, Sean Bergin, Hamid Drake, Marc Ducret, Roswell Rudd, Lonnie Plaxico, Ray Anderson, Pat Metheny, Oregon, John Abercrombie, Aldo Romano, Steven Bernstein e la Sun Ra Arkestra diretta da Marshall Allen – e con importanti musicisti italiani come Enrico Rava, Paolo Fresu, Stefano Bollani, Giovanni Guidi solo per citarne alcuni. È oltremodo attivo anche in territori extra-jazzistici, soprattutto con i vari progetti dedicati all’elettronica e ai relativi lavori discografici collegati come nel caso dei celebrati “9lazy9” (Ninja Tunes) o gli osannati ed ormai storici Matmos. Relativamente a questa dimensione, è importante segnalare la pubblicazione del suo primo disco in febbraio 2015, dal titolo “103 Ep” (Electronique.it Records) e le collaborazioni di rilievo con i celebri Ricardo Villalobos e Max Loderbauer – nel progetto “Re: ECM” – con i dj Nicola Conte e Ralf e con il nuovo progetto in duo con Moritz von Oswald. Attualmente, in qualità di leader, è attivo con il nuovissimo quintetto “Cosmic Renaissance” (con Mirco Rubegni, Francesco Ponticelli, Federico Scettri, Simone Padovani); il nuovissimo Trio 70’s (con Michele Papadia e Stefano Tamborrino); l’ormai consolidato e acclamato duo con Giovanni Guidi, “SoupStar”, fresco di pubblicazione per ECM (“Ida Lupino”, settembre 2016) e di importanti tournée estere; il quartetto “Tubolibre” (con Oren Marshall, Gabrio Baldacci e Cristiano Calcagnile); il progetto in solo “Exp and Tricks”, un vero e proprio viaggio musicale nei cortometraggi dei primi anni del Cinema (produzione originale in collaborazione con la Cineteca di Bologna); in duo con Gabrio Baldacci. Da segnalare anche l’intensa collaborazione con Enrico Rava e il formidabile quartetto Brass Bang, che lo vedo protagonista accanto a Paolo Fresu, Steven Bernstein e Marcus Rojas. 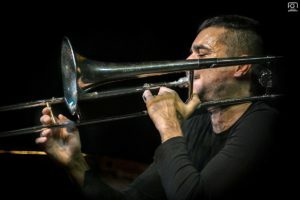 He is one of the most talented trombonist all around the world (winner for two times of the “Down Beat Critics Poll” award as best rising star trombonist), his international collaborations include, among others: Steve Swallow, Greg Osby, Carla Bley, Steve Coleman, Tom Varner, Michel Godard, Lester Bowie, Sean Bergin, Hamid Drake, Marc Ducret, Roswell Rudd, Lonnie Plaxico, Ray Anderson, Pat Metheny, Oregon, John Abercrombie, Aldo Romano, Steven Bernstein and the Sun Ra Arkestra directed by Marshall Allen. Collaborations with italian musicians: Enrico Rava, Paolo Fresu, Stefano Bollani, Giovanni Guidi and many others. In the “ ” he has collaborated with 9lazy9 (Ninja Tunes) and performed with the worldwide famous avant duo Matmos. In the same music fields stands the collaboration with Ricardo Villalobos and Max Loderbauer for the project Re:ECM. He works also with Nicola Conte, dj Ralf and Moritz von Oswald. His first electronic disc, “103 Ep”, is released in February 2015 by Electronique.it Records. Actually he’s active with the new “Cosmic Renaissance”, the quintet composed by Mirco Rubegni (trumpet) Francesco Ponticelli (bass), Federico Scettri (drums) and Simone Padovani (percussions); the new Trio 70’s (with Michele Papadia and stefano Tamborrino); the famous and acclaimed duo “SoupStar”, with the pianist Giovanni Guidi: they recorded a new disc for ECM in February 2015 after an important year (the last one) made by a lot of concerts all around the world; “Tubolibre” Quartet with Oren Marshall (tuba), Gabrio Baldacci (guitar) and Cristiano Calcagnile (drums); the solo “Exp and Tricks”, a musical journey in the first year of the Cinema (project in collaboration with Cineteca di Bologna). 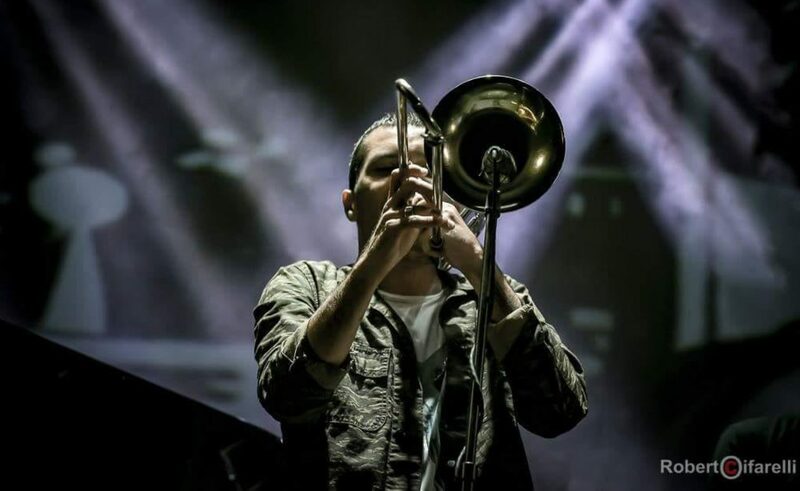 He works continuously with Enrico Rava and recently he created (with Paolo Fresu, Steven Bernstein and Marcus Rojas) the powerful quartet Brass Bang.